Shares of Takeda Pharmaceutical Co. Ltd. (TAK) jumped 1.93% to $20.63 on Monday after results from Phase 3B of the Varsity clinical trial showed the superiority of Takeda's Entyvio to AbbVie's (ABBV) Humira in patients with moderately-to-severely active ulcerative colitis. These patients failed conventional therapy. Entyvio is the brand name under which Takeda commercializes vedolizumab, a monoclonal antibody that is used to treat ulcerative colitis and Crohn's disease. Warning! GuruFocus has detected 4 Warning Sign with TAK. Click here to check it out. The data, which was presented at the European Crohn's and Colitis Organization Congress in Copenhagen, shows the intravenous administration of Entyvio achieved clinical remission in 120 out of 383, or 31.3%, of treated patients at week 52. The results were compared to clinical remission achieved in 87 out of 386, or 22.5%, of patients who were subcutaneously administered with Humira. The study found the difference in the efficacy of the two treatments was statistically significant. Clinical remission indicates the characteristic symptoms of the disease are no longer evident, though the inflammatory process has yet to be resolved. The study also noted a higher percentage of patients treated with Entyvio, 39.7%, achieving mucosal healing compared to 27.7% of those treated with Humira. Takeda's Entyvio was surpassed by AbbVie's Humira in terms of a higher rate of achieved clinical remission at week 52 with regard to patients who were using oral corticosteroids at the beginning of the study but discontinued during the clinical trial. However, in this instance, the difference in the efficacy of the two treatments was not statistically significant. Takeda's Entyvio has already received approval from health authorities in North America and the European Union. Entyvio is a key product in Takeda's portfolio, contributing 35.1% of the total revenue of $12.4 billion for the first three quarters of fiscal 2018, which was nearly 5% higher on a year-over-year basis. Among its other products, sales of chemotherapy treatment for multiple myeloma Ninlaro increased 37%, sales of antidepressant medication Trintellix grew 19.5%, sales of blood cancer drug Iclusig climbed 26% and sales of Alunbrig, which treats non-small cell lung cancer, skyrocketed 151.4%. Takeda also reported a 17.7% increase in core earnings to approximately $3.1 billion, an 11.7% decline in operating profit to $2.6 billion and a 31.7% decrease in net profit to roughly $1.5 billion, or net earnings of $1.9 per share. Humira, the trade name of adalimumab, is the flagship product in AbbVie's portfolio. Besides Crohn's disease and ulcerative colitis, Humira is used to treat a broad range of illnesses, including rheumatoid and psoriasis arthritis, ankylosing spondylitis and chronic psoriasis. Humira accounts for 60% of AbbVie's total revenue, which was $32.75 billion in 2018. Non-GAAP earnings were $7.91 per diluted share in 2018, compared to $5.6 per diluted share in 2017. Other key drivers of AbbVie's revenue were cancer treatment Imbruvica with 42% growth in sales to $1 billion, hepatitis C drug Mavyret with sales of $819 million and Venclexta, which treats leukaemia, with $124 million in sales. 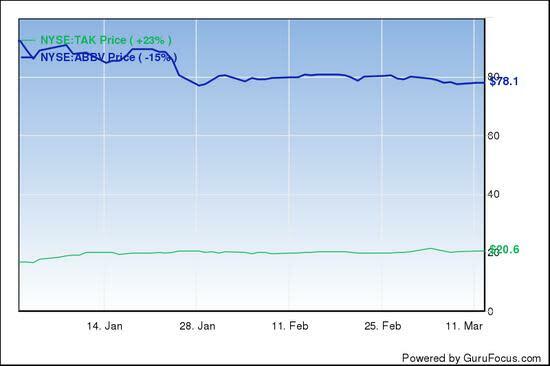 Year to date, Takeda shares have climbed 23% to $20.6 and AbbVie has declined 15% to $78.1. Takeda Pharmaceutical has a market capitalization of $63.92 billion, while AbbVie has a market capitalization of $115.17 billion. Takeda has a 52-week range of $15.50 to $26.95, a price-earnings ratio of 32.88 versus an industry median of 23.77 and a price-sales ratio of 2.03 versus an industry median of 3.1. AbbVie has a 52-week range of $75.77 to $121.45, a price-earnings ratio of 21.28 and a price-sales ratio of 3.68. Wall Street issued a buy recommendation rating with an average target price of $26.96 for shares of Takeda and a hold recommendation rating with an average target price of $90.13 for shares of AbbVie.